This Hubble image of the week shows “Hidden Galaxy” IC 342, which is located 11 million light-years away. 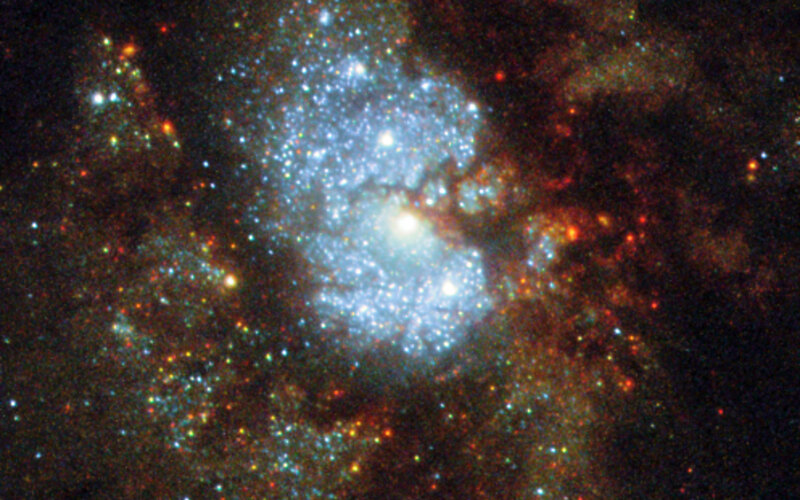 IC 342 is a challenging cosmic target. Although it is bright, the galaxy sits near the equator of the Milky Way’s galactic disc, where the sky is thick with glowing cosmic gas, bright stars, and dark, obscuring dust. In order for astronomers to see the intricate spiral structure of IC 342, they must gaze through a large amount of material contained within our own galaxy — no mean feat! As a result IC 342 is relatively difficult to spot and image, giving rise to its intriguing nickname: the “Hidden Galaxy”. Located very close (in astronomical terms!) to the Milky Way, this sweeping spiral galaxy would be among the brightest in the sky were it not for its dust-obscured location. The galaxy is very active, as indicated by the range of colors visible in this NASA/ESA Hubble Space Telescope image, depicting the very central region of the galaxy. A beautiful mixture of hot, blue star-forming regions, redder, cooler regions of gas, and dark lanes of opaque dust can be seen, all swirling together around a bright core. In 2003, astronomers confirmed this core to be a specific type of central region known as an HII nucleus — a name that indicates the presence of ionized hydrogen — that is likely to be creating many hot new stars. 2 Comments on "Hubble Image of the Week – Hidden Galaxy IC 342"